The tiny village of Bartlett, NE, with a population of slightly more than 100, has a major new attraction in the form of a western art sculpture garden. 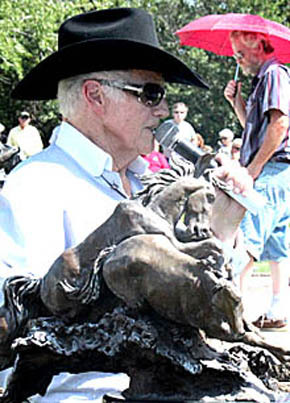 Herb Mignery, famed western artist who grew up on a ranch near Bartlett and now lives in Loveland, CO, recently donated 12 smaller bronze sculptures to join the life-size bronze, Silent Leather, that he donated to the Bartlett community in 2002. A crowd of about 300 people joined Mignery and local leaders to dedicate the new sculpture garden on the Wheeler County Courthouse lawn last Sunday afternoon, Aug. 25.